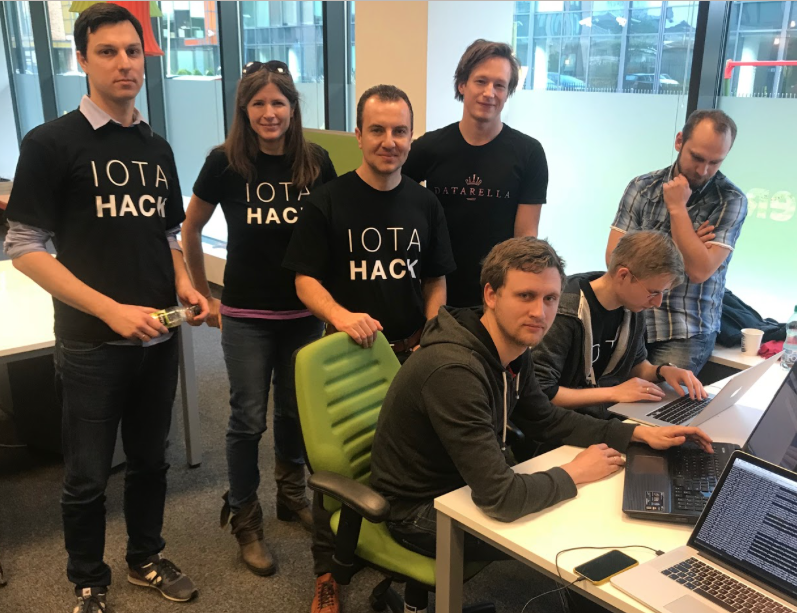 This is the second installment in our posts about the experiences of the "Freedom Pass" team during the IOTA Hackathon. In the first post (found here), Kira set the stage and explained the current issues of the London Freedom Pass. In this post, we'll get a bit more detailed with regards to how we built the project. 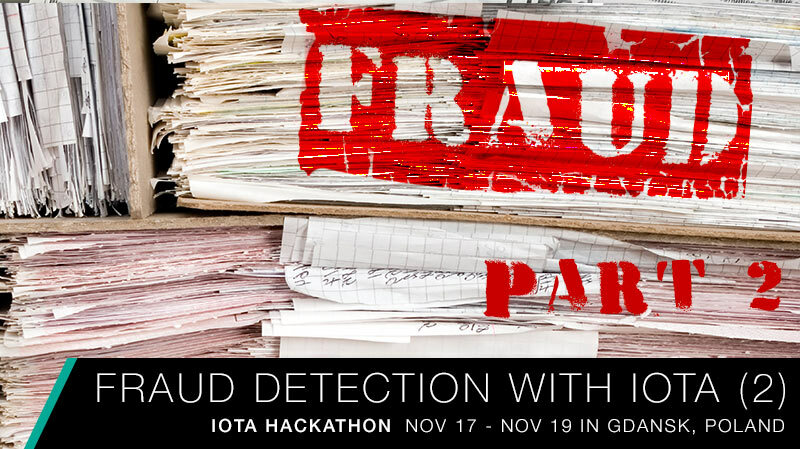 DISCLAIMER: Even though the project is called "Fraud Detection" the technological focus is very much on IOTA and not at all on machine learning-methodologies or data science, as one would commonly associate with fraud detection and prevention. After we'd narrowed the scope down sufficiently to what we thought would be achievable during a hackathon, we started getting familiar with the IOTA tangle. We followed this tutorial for making a simple transaction, written only a few weeks earlier but already with some modifications required. After having gotten ourselves familiar with the general concepts of the Tangle (much accelerated by a presentation and Q&A by Chris Dukakis of IOTA) we connected to a testnet node and started issuing transactions. Before we get into the details of the project, I'll make a short comment about the decision whether to run a full node, the IOTA Reference Implementation (IRI) or to connect to pre-existing nodes. In short, to run the IRI, one needs a complete Java Runtime Environment, which is one of the reasons why IOTA can't be run on an IoT device at this point. Each node connected to the tangle exposes an HTTP API through which transactions can be issued. To set up an instance of the IRI, one has to acquire the addresses of the already connected nodes in the tangle. The recommended way to do this is by asking people in the slack-channel #nodesharing. Because of the above restrictions and our requirements in time, we didn't think it would be necessary to run our own node. Perform a transaction for each certificate between the issuing Doctor to the Applicant. Given the above functionality, how could we leverage the existing IOTA library in the best way possible? Well, since smart contracts or most types of advanced transactions aren't really possible on IOTA (yet), we will need some off-tangle processing, storage and UI. For this, we implemented a backend and some wrapping to process the information from the applications. The server-side was written using Node.JS and the express-framework. To model the logic and structure of the database, we used MongoDB and mongoose. 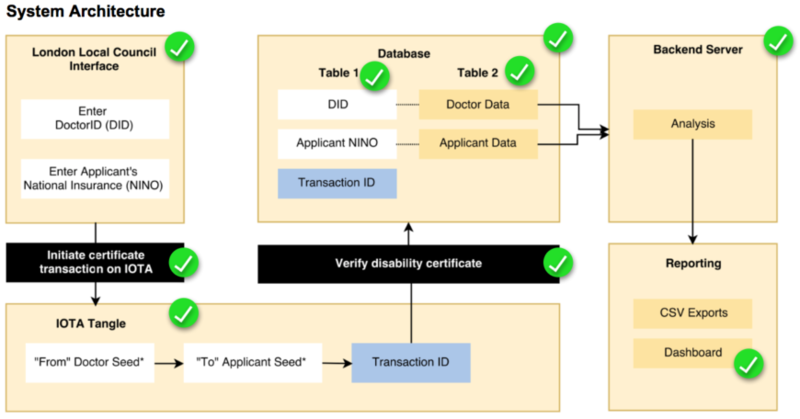 The MongoDB contained a simple key-value store, saving relevant applicant information. One could imagine that is could be upgraded to a graph-model to better mirror the tangle structure and to be able to more efficiently analyse connections between Doctors and Applicants, however, that was out-of-scope during the ~24h of coding we had. an IOTA transaction is issued from the Doctor to the Applicant. To save the information into a MongoDB-collection a controller instantiates and returns a new model containing the just entered data. It passes it on to the server.jswho handles the HTTP-requests from the client. There is no dedicated IOTA API-call for generating seeds, but they do supply a command line command for generating a random seed. We made our seeds relatable to the private information by concatenating the private key with the national insurance number for the Applicants and the Doctor's ID for the Doctors. After the seed was generated, a fresh address is created for each new transaction. To make the functions from the iota.lib.js a bit more usable, we wrapped the existing callbacks-based structure in Promises. This allowed our code to become a bit more asynchronous than it is 'out-of-the-box'. Once the data and the transactions were issued, the next step was to provide a way of viewing the existing applications and certificates. So we created a second page of the UI for listing all applications with relevant information read from the MongoDB-collection. This doesn't, however, provide such a great way of finding the main type of fraud that we were considering, namely Applicants reusing information about Doctors. This makes it look like a single Doctor issued an unreasonable amount of certificates. A pretty easy case to catch, one would think, but considering it is a completely analog process done by on paper in different boroughs by different administrators, it sums up to quite a large amount of faked applications. This is the type of fraud we focussed on in our processing. So how can we in a user-friendly way flag cases that should be investigated? 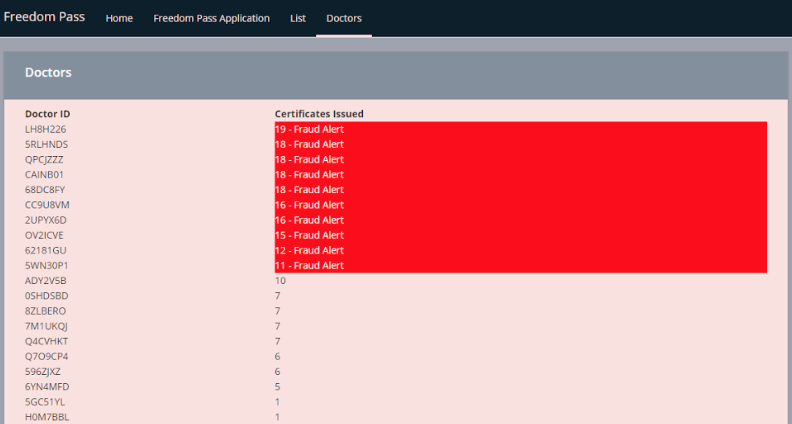 We chose the simplest option and created a second view of the UI where each Doctor in the system is listed along with the number of certificates they've, supposedly, issued. The list is sorted by the number of certificates issued. Here one could imagine making it a bit smarter by including the date the certificate was issued and creating a more differentiated metric of certificates per time unit, but it wasn't in scope this time around. If a Doctor issued more than 10 certificates, they were highlighted in red. A very simple but potentially efficient way of communicating to the user that something needs to be investigated. Of course, the number 10 was completely arbitrary and could have been chosen differently. In fact, to decide that number, one would have to, first of all, analyze historical data. To sum up, Team Freedom had a lot of fun and learned tons about IOTA, ideation, cooperation, and creation in a short time-frame. We managed to build a functioning Proof of Concept for how IOTA can be used for the secure issuing of medical certificates in order to prevent and detect fraud. The application to the Freedom Pass was done so that it would be easier to understand what was being done and why. But that does in no way mean that the base structure cannot be used for other purposes, in fact, it was written specifically to be general enough that it is also interesting in other areas. Is this the only way that the problem could have been solved? No. Was it the easiest way of solving it? Absolutely not. However, we believe that only by experimenting and utilizing one of the few scalable and future-resistant distributed ledger solutions can we achieve applicability. There is, generally speaking, almost no distributed ledger application that could not have been done without the use of a distributed ledger, but it would have incurred great financial, organizational or trust costs. IOTA is a very cost-effective and scalable solution, but with the caveat that it is still in its infancy.